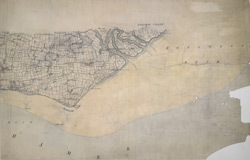 This drawing shows the flat marshlands of Foulness Island . The draughtsman has indicated the sands by stippling and detailed the channels leading from the North Sea. The most striking feature is the sea wall, shown as a grey angular line extending along the coast and the channels. A signal staff is marked at Wakering Stairs, while the word 'Flag', indicating a trigonometric station, is marked at Aspins Head.